Fuzziwig's Candy Factory is a self-serve candy store cleverly designed to look like a fun, whimsical candy factory. Each store is decorated with animated "candy-making" machines, with over 400 varieties of candy, hard-to-find specialty toys and plush animals thoughtfully organized and displayed to create an enjoyable shopping experience. Many locations also offer self-serve soft drinks, ice cream, popcorn, cotton candy and FuzzifizzTM, a proprietary frozen carbonated drink. Business Planning - One of the first things we do when you become a Fuzziwig's Candy Factory franchisee is help you map out your business plan. You'll receive the Fuzziwig's Candy Factory Preliminary Store Planning Handbook which walks you, step-by-step, through the procedures. 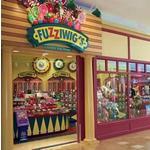 Store Location - Choosing a location for your Fuzziwig's Candy Factory is one of the most important business decisions you'll make. We'll help you choose the perfect location. Support & Training - Our Franchise Training Program gives you all the training you need. You'll have the opportunity to train at an actual Fuzziwig's Candy Factory store where you'll learn first-hand what it takes to run the business. You'll also benefit from classroom-style training led by our team of experienced business professionals. Operations - We have developed the systems, policies and procedures to keep your business running "as smooth as milk chocolate." From hiring policies to inventory management, you'll find all you need to know in our Fuzziwig's Candy Factory Operations Manual. Marketing, Merchandising & Advertising - We help you manage your store advertising and marketing plan with proven promotional ideas, seasonal calendars and camera-ready artwork. Learn more about this exciting and delicious opportunity!